Ordinarily… not a lot… a bag of Twiglets and a can of Rio Tropical. But log on to Wahanda today, ‘cos they’re changing all that! If you’re lucky enough to live near London, Birmingham, Manchester or HOT new Wahanda location LEEDS, then you can bag yourself £20 worth of treatments for a measly £2! None of the links above are affiliated… though if you’d like to use my personal link to sign up (it bags me a £5 Wahanda voucher, you can do so here). 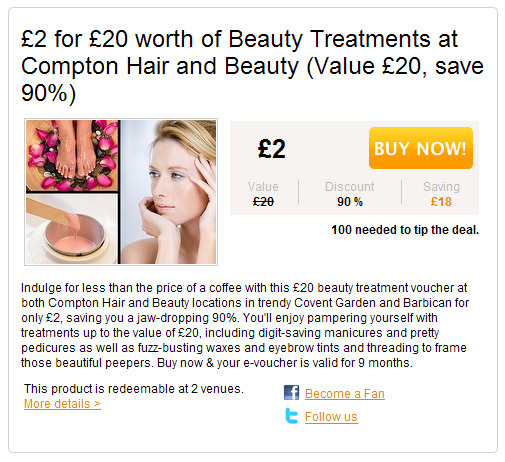 I’m going for this deal, I need my roots doing… with the voucher, it’ll cost me £10! Could I love Wahanda’s Mob Deals any more? Seriously…. I’ve never experienced such indulgent pampering in my life!